So, we’re a little late getting this posted again this week, but I’m cutting myself some slack due to the holidays. 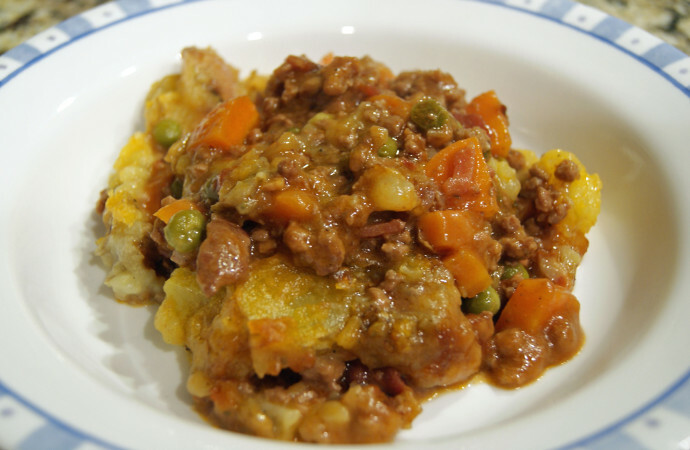 For our Dark Days meal last week, we made a hearty shepherd’s pie (though it’s made with beef, not lamb, so technically maybe it’s not actually shepherd’s pie; oh well). I used fresh, local ground beef and bacon, and the carrots, potatoes, and peas (about half of the small amount of shelling peas I got this year) are from the garden. I skipped out on the sour cream and cheddar cheese that the original recipe calls for since we don’t have a local supplier. The beer is from the Great Lakes Brewing Company, a well-known hometown brewery in Cleveland. This is a very rich, filling meal, good for eating with a fire in the background. 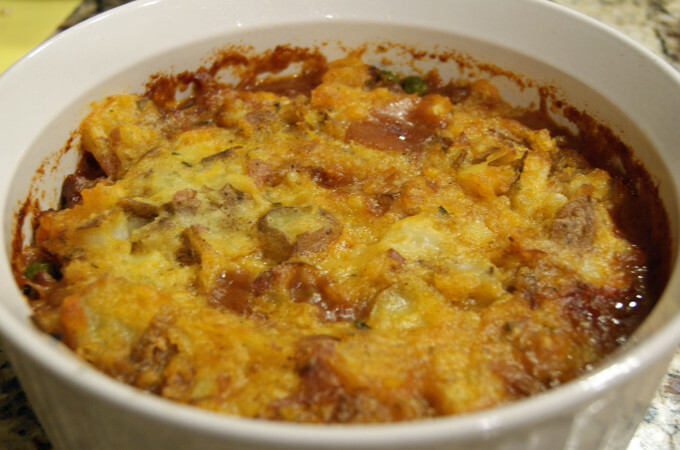 Prepare potato topping: In a large saucepan add the potatoes and garlic and cover with water. Bring to a boil and cook until the potatoes are fork-tender, about 15 to 20 minutes. Drain and move the potatoes and garlic to a large bowl. Add a little water (or milk), butter, salt and pepper, and beat on low speed with a hand mixer until the potatoes are light and fluffy. If the mixture is too dry, add more liquid. Cover and set aside. Prepare filling: Heat a large skillet over medium heat, then add the bacon and cook, until brown and almost crisp, about 7 to 8 minutes. Move the bacon to a plate and set aside. Add the oil to the drippings in the skillet and put over medium heat. Add the onions and salt, and cook, stirring occasionally, until the onions are very soft and just beginning to brown, about 10 minutes. Stir in the beef and cook until it begins to brown, about 7 minutes. Add the carrots, peas, and garlic and cook until the vegetables begin to soften, about 5 more minutes. Stir in the tomato paste and flour and cook, stirring, until well blended, about 2 minutes. Add the beer, bring to a boil and boil for 3 minutes. Cook, stirring with a wooden spoon, and scraping up the browned bits from the bottom of the pan, about 2 minutes Add the cooked bacon, about 1/4 cup water (or broth), rosemary, salt and pepper, and bring to a boil. Reduce the heat and simmer until the sauce thickens, about 15 minutes. I always add a little more flour to thicken it up a bit more. Spoon the meat mixture into a greased 10-inch round baking dish. Spread the potato topping evenly over the beef mixture. Bake until the filling is hot, the topping is lightly browned and the edges are bubbly, about 35-40 minutes. Let rest out of the oven for 10 minutes before serving. Sprinkle with parsley and serve. This one’s so good, it’s always tough for us to not finish the entire thing the night that we make it.